Everybody loves summer because the sun shines bright and brings joy to every person. However, it is important for parents to ensure that their children are in a good mood and with the right clothes. Unlike purchasing clothes for adults, parents must factor in several factors when it comes to kids summer fashion. These tips will help you choose the best wardrobe for your little angels. There are numerous options for children, this makes it challenging for any parent to select suitable clothes for summer. It is essential for parents to buy clothes before the summer period. This will make it easier for them to consider the fashion needs of their children. Go for clothes that are made from one hundred percent cotton. Pure cotton fabrics are ideal for summer because they will allow air to get to the body and evaporate unlike materials like nylon, which attach to the skin causing irritation. In addition, purchase darker shades of colors so that they can block sun rays. You should avoid black colored clothes and go for white because white will reflect light rather than absorbing it. Shorts are ideal for children because they allow air to get to the legs. Always select a short design or style that blends well with the personality of your kids. Always go for shorts that can be easily matched with different types of tops. Go for sleeveless shirts, however always ensure that you apply a substantial amount of sunscreen on any part of the body that is uncovered. You should also look for great looking hats especially for children who have very little hair on the heads. Kids have a tender skin therefore, a parent should always be mindful of the sensitivity of the child to the damaging sun rays. Summer is a great time for the kids to swim therefore, ensure that the kids have great swim suits. This will allow them to have memorable fun swimming. Board shorts are also good especially for your little boy to spend quality time at the beach. Whole swimsuits are good for girls because they ensure that their bodies are protected against harmful sun rays when they are running in and out of the swimming pool or beach water. Shoes also play an important role during summer. Therefore, you need to take extra time when purchasing footwear and be ready to spend a little more cash. For babies and children below 3, you should buy sandals that have Velcro straps, if possible a brand with ankle straps. Select sandals that will prevent the feet from excessive sweating. Ensure that the shoes are in good shape and very comfortable. Always ensure that the children have clothes that are appropriate and comfortable. This will allow them to engage in outdoor activities safely. Their clothes should be airy and light weighted to ensure that they are always cool and fresh when they play. Dressing your kids can be quite tricky during summer times. 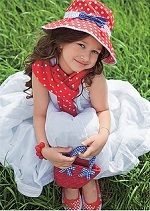 However, go for a combination of affordability, style and durability when purchasing kids summer fashion clothes. View the different styles available and with these few tips and ideas, you will find that cladding your children is a simple process that will also help in enhancing the personal perception of the kids.